Can’t find it here? Try the wiki. Only employees flagged as a Warehouse Mgr can access eoTouch Warehouse. Employees will only be able to mange inventory for their assigned warehouse. eoTouch must be properly installed and configured to operate correctly. The following articles provide instructions for using the various menus and features available in eoTouch Warehouse. The Sync menu contains the available options for transmitting information to and from the database. Download – Retrieve the current snapshot of the database. Upload – Sends all saved work and transactions from the handheld device to the eoStar backend. All uploaded data will no longer be available on the handheld. Updated inventory information is also downloaded if Live Inventory is enabled. Full Sync – Sends all saved work and transactions from the handheld to the eoStar backend and downloads a current snapshot of the database. Only available if Live Inventory is enabled. Erase all your entries – Deletes all saved work and transactions from the handheld. Anything that has not been uploaded will be lost. Only available if BETA mode is enabled. Each time a mobile device is synced, the data being uploaded is captured by the server before it is posted to the database. The captured data is then validated against what was posted to ensure no data was dropped. If the server identifies a discrepancy, it will return a message to the mobile device instructing the user to either re-submit the data (perform the sync again) or contact Rutherford Support. It is recommended to attempt another sync at least once, as this usually takes care of the issue. If the server continues to return the message, contact Rutherford Support and send in an archive for analysis. Counts of inventory in the user’s assigned warehouse can be recorded in eoTouch Warehouse. A full sync containing a count will automatically close the open inventory batch in eoStar and populate the count panel with the synced quantities. For instructions on recording counts, please see the eoTouch Warehouse – Count Inventory article. Inventory in the user’s assigned warehouse can be written-off in eoTouch Warehouse. For instructions on writing-off inventory, please see the eoTouch Warehouse – Write Off Inventory article. Inventory in the user’s warehouse can be repacked into a different pack size. This can be useful, for example, to combine loose units into cases. For instructions on repacking inventory, please see the eoTouch Warehouse – Repack Inventory article. Purchases can be received in eoTouch Warehouse, allowing users to verify quantities, record date codes, and enter a note right from the tablet. In the event a purchase is delivered, but was not entered in eoStar ahead of time, a new purchase can also be created as part of the receiving process. For instructions on receiving purchases, please see the eoTouch Warehouse – Receive PO article. This screen is currently not used by eoTouch Warehouse and will always be empty in this mode. The mobile device is used by different warehouse staff from day to day. The normal user is on vacation or sick and someone is filling in for the day. All transactions entered during the session will be logged as having been performed by the selected user. The available user’s are listed in alphabetical order. Only employees flagged as a Warehouse Manager and assigned the same warehouse as the current user are included. The currently logged-in user is indicated by a check-mark. The user assigned the mobile device’s handheld number is listed at the top. Use the Search box to find a specific user. Tap a user’s name to select them. If necessary, enter the selected user’s Employee Access Password. Employees with a password are indicated by a lock icon. This is the Access password from the employee record’s More panel. The selected user will immediately be logged-in and returned to the main screen. Tap < Home to return to the main screen without changing the user. Archives are used to package a copy of the data from the current session and send it to Rutherford Support for investigation or manual uploading. This is particularly helpful if there are issues syncing or eoTouch is crashing. 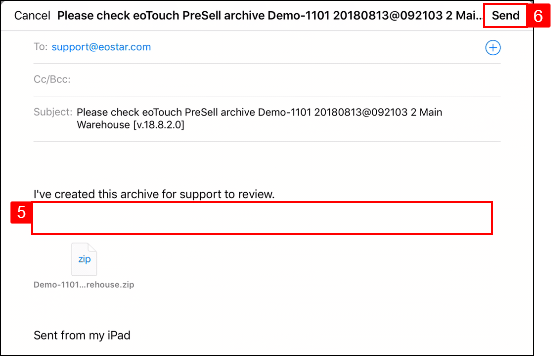 Once support has an archive, they can upload the transaction information to eoStar and/or investigate the audit logs for the source of the crash. Tap the + to create a new archive from the current session. The newest archive is placed at the top of the list. Tap Mail to Support@eoStar.com to email the archive using the Apple email client. Add a brief explanation of the reason for sending the archive. I am unable to upload, please manually upload my transactions. 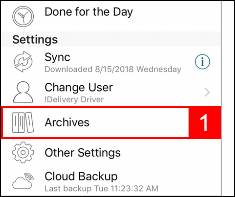 Tap Share Archive to send the archive using a different method such as an email app. This is particularly helpful when using Outlook email. Sometimes the desired method is not listed, tap More to see additional options. Enter Support@eoStar.com as the To. Enter a brief explanation of the reason for sending the archive. Tap Cloud Backup to backup the current session to the eoNetservice on the server. Copyright © 2019 Rutherford and Associates. All rights reserved.